Good news for the “if you can dream it you can do it” folks. Another vote in favor of positive thinking comes from Heidi Grant Halvorson. That’s right. She joins the wisdom traditionalists like the annoying Florence Scovel Shinn and Louise Hay, the spiritualists like Deepak Chopra, the businessmen like Mr. Dale Carnegie and Norman Vincent Peale, and the “success scientists” like Matthew Syed, who wrote Bounce, in touting the importance of positive thinking in reaching your goals. But, and I know I’ve mentioned this before, the type of goal you’re aiming for and the type of positive thinking you do about it influences your chances of success. First of all, you’ve got to be motivated. There’s a fancy theory psychologists named about motivation called the Expectancy Value Theory, which means, according to Heidi Grant Halvorsen, “people are motivated to do anything as a function of (1) how likely they are to be successful (that’s the expectancy part) and (2) how much they think they will benefit from it (that’s the value part.)" So if you’ve got your motivating goal, then go ahead and visualize achieving it. But, readers, you must also remember that your goal should be difficult, specific, and you can’t simply visualize breezily zipping over the finish line through the ribbon to claim your laurel wreath. You must visualize all the obstacles you might have to overcome, and visualize overcoming those, too. Sounds daunting, doesn’t it? And in fact, H.G. Halvorson has a distressing passage about weeding out unrealistic goals, by considering if the obstacles you envision are too great. Which seems to beg the whole question of achieving your dreams, if you really think about it in a certain type of depressing way. Nevertheless, if you can visualize both those obstacles and overcoming them, then you are set to go go go for it, because people who do that have the persistence and are willing to put in the planning and effort required. Those of us who prefer to imagine “podiuming” (in the immortal words of that adorable snowboarder Shaun White who won the gold in the last Olympics ) are more likely to be unprepared for the difficulties we will inevitably encounter on our runs down the mountain. If it all seems too exhausting, consider that question of motivation. I know there have been times when I’ve hardly noticed the hard work I put into achieving a goal because I was so motivated to achieve it.For example, the year after college (an excellent time to learn a life lesson), my friend Cathy and I wanted to move to San Francisco. We got out there, and my handsome friend Phil offered to take us around to look at places. He borrowed a VW bus from his friend Eddie, a former Buddhist monk who was at the time laid up in a Silicon Valley hospital with two broken legs from hang-gliding. Phil drove us all around the city. It took all day. We looked at 20 apartments. 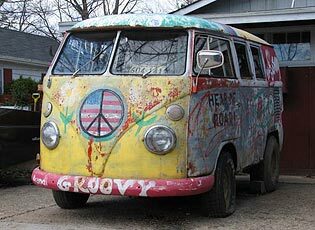 When we finally found one we liked and could afford in Haight Ashbury, we had to beg and plead with the landlord to take a chance on us. My friend was unemployed and waiting to hear from the Peace Corps, and I had a job as a paralegal. It was only after handsome Phil rumbled off in Eddie’s bus that I realized how exhausted I was. And I learned a lesson that day, readers. The lesson was, that if you really, really want someone--I mean something--then the work involved doesn’t bother you at all. Just discussing last night with my husband how many hours I put in to this 'writing-thing' he calls it. He is very supportive but I sometimes feel guilty, he's in the other room watching TV and I'm typing. Anyway, to me, spending so much time on this 'writing thing' is a joy. Thanks for the motivational motivation post. Now I know where I'm at...I think. What a concept--writing while my husband is in the other room watching TV. I just might have to try it. But then I'd miss our DVR of Jon Stewart. SO much fun to read more into the story about wanting someone—uh, something. Now about this visualizing breezily zipping over obstacles thing. I'd never thought about that. I might buckle under if I anticipate obstacles, and never take a risk. But it makes sense to do so. I think I'm positively better at in when I'm dreaming. I have this recurrent theme of trying to get somewhere in a bus but needing to cross deep water, drive up a steep incline and down mountainous unpaved paths. In the dream I don't actually know where I'm trying to go; I just know I have to get across these obstacles. Hmmm. If only I were an expert on dream interpretation. Yours seems pretty symbolic. I have a recurring dream, too, about being on a steep beach and a very big tide is rolling in, threatening to wipe away everyone and everything on the beach. I have confidence I'll ride the wave and make, but it's scary--ominous. I've had that dream off and on for decades. I'll be writing more about Heidi Grant Halvorsen. She addresses exactly your concern later in the book: some people need to take into account that if the goal is too hard seeming, they'll buckle.